To be fair, it's important to note that we love coffee! No matter what roast or blend is in the pot, it will be finished to the last drop. Kicking Horse offers roasts and blends that cater to different types of coffee drinkers from dark and espresso, to a more mild roast. In this Kicking Horse coffee review we will take a look at 4 of their roasts and blends to help give you an idea of what to expect. 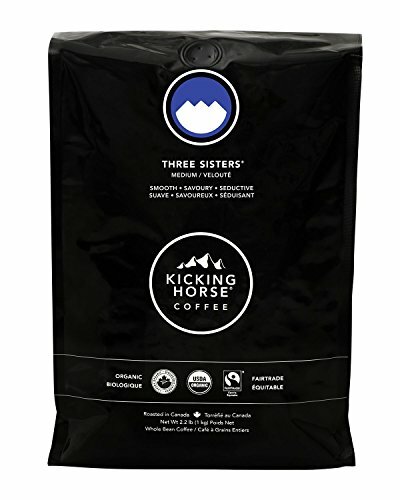 Kicking Horse Three Sisters is our favorite blend. Why? Because everyone in the office can appreciate it and seem to enjoy it even if they are fans of roasts at one extreme or the other. The original dark roast from Kicking Horse is grown in Indonesia and South America. These organic beans are certified fair trade, so buyers can be assured that the growers of these sweet, strong beans have been compensated for their efforts. The Kicking Horse whole bean coffee labeled as original dark roast is roasted in fresh Rocky Mountain air. Some find these beans to be oily when the package is opened. It should be noted that coffee beans are naturally oily; that's where the caffeine lives, and Kicking Horse delivers a hearty jolt of caffeine. However, if you have a blade grinder, the oil in the beans may become clogged with coffee dust. You'll have better luck with a manual grinder, burr grinder, or even a mortar and pestle. The original roast offers a sweet, smoky flavor with little acidic edge or bitterness. The flavor is strong but smooth. It's a great cup of coffee to drink black or doctor with creamers, sweeteners and other flavors. Try this bean ground coarse in your french press for 3 minutes 30 seconds of steeping. If the flavor is pleasant but not over-powering, go for the full 4 minutes, and enjoy a productive day! 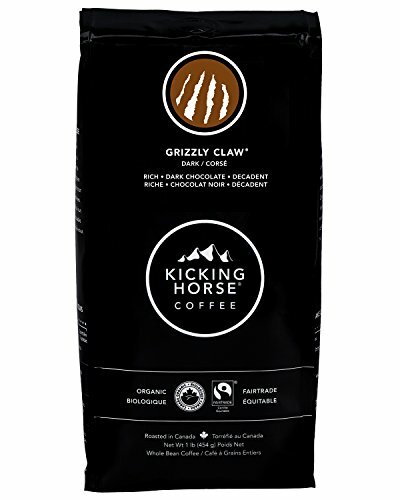 Kicking Horse has created a medium roast bean blend﻿ for espresso fans with sweet and chocolatey beans from South and Central America, Africa and Indonesia. The Cliff Hanger blend of delicate flavors, roasted to full flavor without the bitter edge that can occur in a dark roast, means that espresso drinkers can enjoy full flavor and full intensity with no bite. This second point is critical. For great crema, you need freshly roasted, freshly ground beans. For this quality grind, a burr grinder is ideal. To reach an espresso grind with a metal blade means you will spend more time abusing your beans than chopping them. 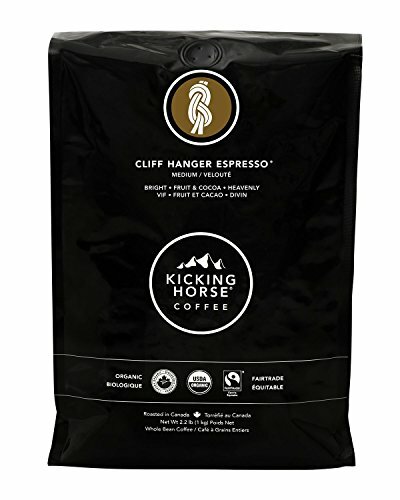 Kicking Horse Cliff Hanger offers coffee drinkers of all stripes a quality medium roast, compiled from coffee experts all over the world. While this product doesn't have the caffeine level of some caffeine-enhanced coffee products, you will enjoy the flavors and aroma of fruit, chocolate, and coffee with no bitterness. If you like a dark, smoky and slightly bitter espresso, this one may not thrill you. However, fans of mild roast coffee may love this roast at a coarser grind for a smooth, slightly sweet cup of delicious coffee. The coffee experts at Kicking Horse named this drip ground coffee after three mountains in the Canadian Rockies. Th﻿ree Sisters﻿ coffee includes some dark roast beans, some light and some medium. Because it's ground for you, all you need to do is open the package and enjoy! This ground blend is made of beans grown in Central and South America and Indonesia. The combination of different blends is designed to produce a very smooth cup of coffee. To some drinkers, this may seem weak because Three Sisters doesn't have a bitter tang or a sharp, acid flavor. However, fans of dark roasts and fans of mild roasts will find something to enjoy in each sip of Three Sisters. This unique blend of dark, medium and mild is ground and ready to brew up in your drip coffee maker. As with any food or drink, your taste is the final judge. If you don't feel you've had coffee until your taste buds have taken a bit of abuse, then a lighter roast probably will not taste like coffee. However, if a plain cup of coffee with no need for sweeteners, creamers or other flavors appeals to you, try Kicking Horse Three Sisters. Fans of dark, rich coffee will absolutely love the decadence of Grizzly Claw. Grizzly Claw is sold medium ground for a filter drip coffee maker and is ready to brew. The beans are purchased in South and Central America from organic coffee farms where the grower is justly compensated. All Kicking Horse coffee is also Kosher. Fans of a milder, sweeter medium roast may find Grizzly Claw to just be too much. This dark roast bean has been exposed to enough heat to give the oil and coffee beat "meat" a bit of a smoky edge. If medium roast is your thing, try this coffee with a flavored creamer or a cinnamon stick for a bit more sweetness. Kicking Horse Coffee of Invermere BC offers a product line of bold, flavorful coffee intent on getting their customers up and moving. This civic minded organization supports the preservation of wildlife, literature and the arts, and fair trade coffee. Owners Elana Rosenfeld and Leo Johnson started experimenting with different coffee roasts in 1996, and have built a company that focuses on organic beans and fair trade practices. Kicking Horse coffee is sold both whole bean and ground, and can be ordered at a particular grind, such as espresso, from their website. Kicking Horse coffee is not a company that caters only to caffeine fans in need of a powerful punch. While their products do offer a healthy jolt of morning boost, they also sell decaf blends with great flavor regardless of caffeine. Their wide variety of roast intensities and geographic variety indicates that this is a company intent on offering great taste, not just a bitter edge or acidic bite.